...And if you haven't, I suggest you don't read this post. If you'd like to read my spoiler-free review, go here. It was really good. I mean, from the view of a person who's nearly memorized the book, it felt like the whole thing was zipping by, but it was very well done. They intercut arena scenes with scenes from the Gamemakers room, which I thought was very cool. They added some new details, kept a lot of what I thought were important ones, but of course, omitted some as well. District Twelve saluting Katniss after she volunteers. The fiery Opening Ceremony suits. Peeta explaining that he doesn't want to become "a piece in their games." Peeta shaking his head before the gong sounds. The girl starting the fire under Katniss' tree. Rue pointing out the tracker jackers. Peeta camouflaged by the streambank. Peeta talking about the first time he saw Katniss. Peeta, Katniss and the nightlock. Madge Undersee. She doesn't give the pin to Katniss, Katniss picks it up at the Hob, of all places. Haymitch falling off the stage. The baker visiting Katniss in the Justice Building. Cinna instructing Peeta and Katniss to hold hands. The interview dress the way it was described. Katniss nearly dying of dehydration. Of course, they left out plenty of other things as well, but these are just the details that I thought were important. Did I like it? Yes, yes I really did. I may have even loved it. I left the theater feeling almost hysterical and giggly. It was also really nice to go with a friend, since we made side-comments "They left that part out!" to each other the whole way. When the mutts came out, we both jumped a foot into the air. It was pretty funny. I think the best thing about the movie was how they portrayed the repulsiveness of the Games, without having blood and gore spewing all over the screen. Some parts made me jump, the tracker jacker scene had me going "ewwww" (but that was mostly because I despise wasps of all kinds), but it wasn't over the top. Peeta: Can I just say how completely perfect Peeta was? Josh Hutcherson is amazing. His facial expressions, his mannerisms, completely blew me away. There was this one scene, where he's crying after being reaped, and I pretty much burst into tears. His pain was actually unbearable. And of course, he's pretty attractive. Prim: Erm...I don't think I liked Prim, actually. For one thing, I don't remember her being as melodramatic and, well, loud as Willow Shields portrayed her. I thought of her more as the quiet and brave type. Gale: Impressively, I actually almost liked Gale. Liam Hemsworth's version didn't annoy me the way the book Gale did. He seemed less fiery, and more caring and devoted. Haymitch: Was hilarious. Woody Harrelson was a good Haymitch, playing the drunkard and the concerned mentor very well. He's definitely in a lot of my favourite scenes. Effie: Elizabeth Banks was perfect for Effie! She's ditzy, and talks in an annoying high pitched voice, and even though she seems completely clueless she's surprisingly forceful. Rue: Despite the notable adorable-ness factor, I actually wasn't all that impressed with Amandla Stenberg's performance. She wasn't horrible, but she wasn't fantastic either. She did do her death scene reasonable well, and I did cry when she died. Cato: This might just be because I'm prejudiced against Alexander Ludwig, but Cato got on my nerves. In the books, I admire him, to a degree, but in the movie, all I was thinking was; "Gosh, was a LOSER!" I don't know if it's the spectacular amount of arrogance Alexander projects, or if it was bad acting. I'll have to puzzle this out. Clove: Isabelle Fuhrman did the menacing tiny villain very well. Clove is my favourite Career (when I say favourite, I mean the one I despise the least), and Isabelle portrayed her nasty, conniving character just right. Cinna: He was actually another so-so one. Lenny Kravitz was barely in the movie, actually, and what little I did see of him didn't overly impress me in any way. Caesar Flickerman: I'm already a Stanley Tucci fan, and this movie didn't take away from that. He was funny, he was dramatic, he was perfect. And his hair. AHAHA HIS HAIR. President Snow: Donald Sutherland didn't creep me out nearly as much as the President Snow in the books did. For one, I pictured him a lot more... grotesque looking. But he was still extremely intimidating. Seneca Crane: Since we don't really get to know him in the books, I can't really compare him. But Wes Bentley was very good, he played the ignorant, heartless Gamemaker very well. So here's my scatterbrained, spoiler-filled, fangirling "review" of sorts. I'm going to bed now. I'm tired. I went and saw it with my mother. It was amazing!!!! Plus it was more fun seeing it with Mum because she loves the book too. I saw it too! And even though I loved it, I agree... it could have been better if they would have stayed true to the book. But I guess we can't hold them to TOO high of a standard, catching fire will be better, I know it. Ahhh!!! Now I really really want to see this!!! I think they go most of the really really important points, so glad that it is not gory. I am not sure if I like how Peeta looks, I think she looks nice, but I am not sure.. :) I love her interview dress in the book!!! How could they not do that! 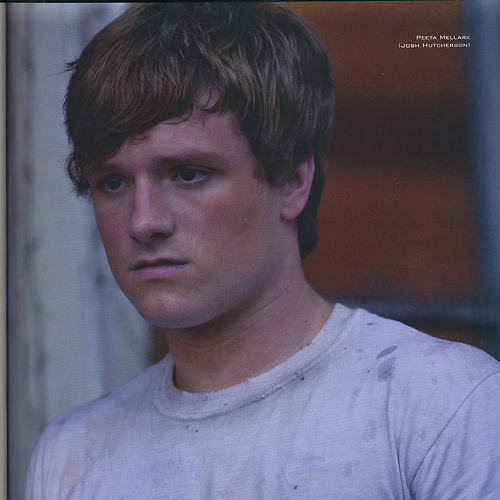 I LOVED Josh Hutcherson as Peeta!!! I liked the guy who played Gale, but I categorically hate Gale. For one thing, Peeta is way better for Katniss than Gale (sorry, he is.) For another, he created those horrible bombs - the ones that KILLED PRIM! So therefore...I do not like Gale. At. All. AGH! I am so tempted to read all of this but NO SPOILERS FOR ME!